Weather at the finish city of Longwy at 2PM, local time: 21C (70F), partly cloudy with the wind from the west at 18 km/hr (11 mph). No rain is forecast. The race: 195 riders started the stage at 12:26 PM. Today Team Sky is enjoying its 60th day of owning the yellow jersey, starting with Bradley Wiggins' 14 days in 2012. Km 100: The break is being kept at about two minutes lead. Km 113: Nills Polittt and Nathan Brown went clear from the break on the second KOM ascent, the Côte de Wiltz. They are 30 seconds ahead of the other four and 2min 30sec ahead of the main peloton. Km 122: Nathan Brown was first over the Côte d'Eschdorf, making him the new KOM. 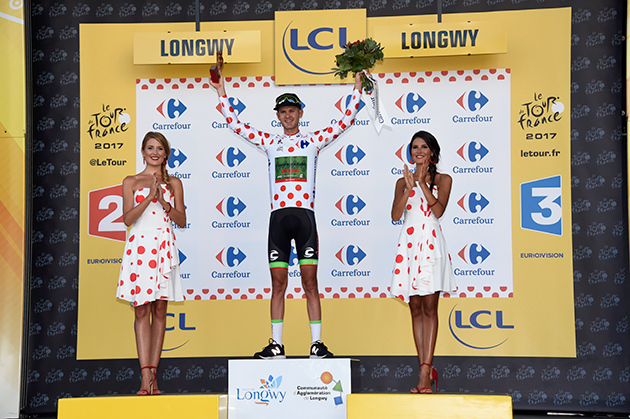 That keeps the polka dots in the Cannondale-Drapac family as they migrate from Taylor Phinney. The break has regrouped and now the six riders are together, 2min 30sec ahead of the peloton. It hasn't been a fast stage. After three hours of racing the average speed is 39.6 km/hr. Km 160: The pack closed into about 1 minute of the break. That allowed three riders to bridge up to the escapees. The break: Nils Politt (Katusha-Alpecin), Thomas De Gendt and Adam Hansen (Lotto-Soudal), Lilian Calméjane and Romain Sicard (Direct Energie), Nathan Brown (Cannondale-Drapac), Frederik Backaert (Wanty-Groupe Gobert), Pierre-Luc Périchon and Romain Hardy (Fortuneo-Oscaro). The nine riders off the front have a lead of 1min 20sec with 51 kilometers to go. Km 180, 33 to go: The break split. Périchon, Hardy, Calmejane and De Gendt are 1min 38sec ahead of the pack. The other breakaways have been absorbed by the peloton. 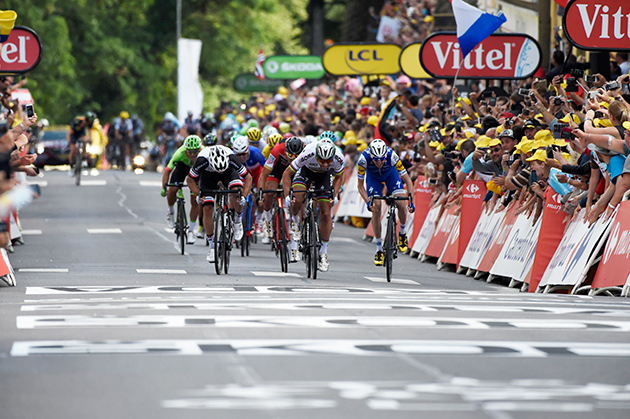 The finish: From those four, Lilian Calméjane went clear on a solo bid for the stage win. He was caught with 10km to go, setting things up for a sprint. Peter Sagan won the sprint. Geraint Thomas retained his GC leadership. 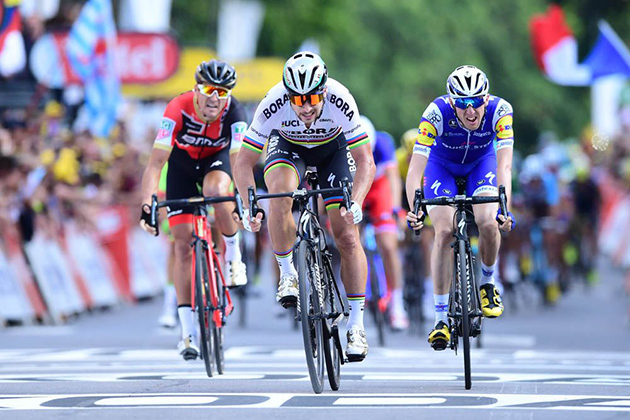 A hot favourite for the uphill finish in Longwy as the Tour de France returned to France, Peter Sagan claimed his eighth stage victory since he made his debut in the event in 2012. He outsprinted arch-rival Michael Matthews who came second to him in the 2015 world championship. 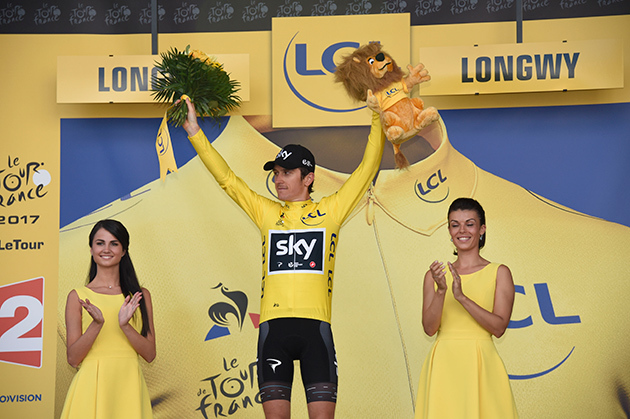 Geraint Thomas retained the yellow jersey while Chris Froome moved up to second in the overall ranking. 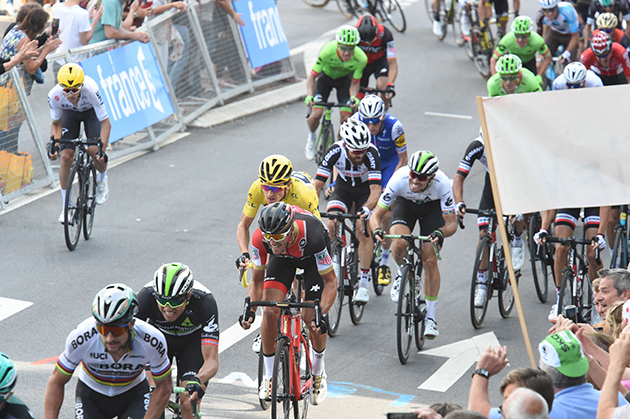 195 riders started stage 3 of the 104th Tour de France from Verviers, Belgium, to Longwy, France via the Grand Duchy of Luxemburg. Belgian riders were extremely motivated when the start proper was given but at km 10, Nils Politt (Katusha-Alpecin), Adam Hansen (Lotto-Soudal) and Romain Hardy (Fortuneo-Oscaro) managed to ride away. 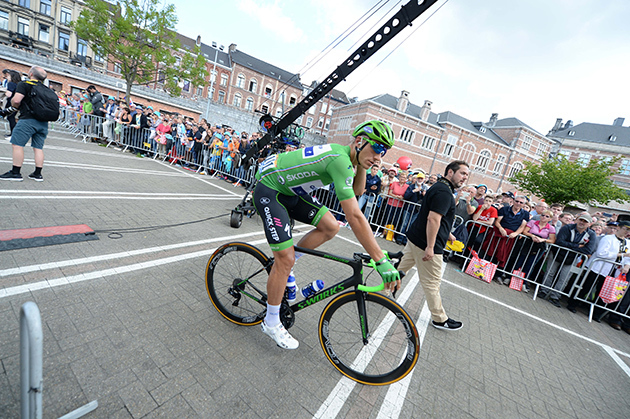 They were rejoined by Nathan Brown (Cannondale-Drapac), Frederik Backaert (Wanty-Groupe Gobert) and Romain Sicard (Direct Energie) at km 13 to make it a six-man group in the lead with no reaction from the peloton. However, teams Bora-Hansgrohe, Quick-Step Floors and Sunweb maintained the time gap around two minutes until the intermediate sprint at Wincrange, Luxemburg (km 89) where Politt crossed the line in first position while Marcel Kittel (Quick-Step Floors) made sure there was no threat for his green jersey. Fighting for the polka dot jersey, Brown and Politt rode away before the category 3 côte d'Eschdorf where Brown virtually became the fourth American leader of the King of the Mountain competition in the history of the Tour de France after Greg LeMond (1986), Tejay van Garderen (2011) and Taylor Phinney yesterday. As the regrouping of the six breakaway riders occurred at km 123 and the peloton took it easy for a little while, a maximum time gap of 4.05 was recorded. The same teams Bora-Hansgrohe, Quick-Step Floors and Sunweb brought the gap down to two minutes again. With 57km to go, Thomas De Gendt (Lotto-Soudal), Lilian Calmejane (Direct Energie) and Pierre-Luc Périchon (Fortuneo-Oscaro) rejoined the six leaders. The group of nine split up 48km before the end with De Gendt, Calmejane, Hardy and Périchon forging on with determination. The day after crashing along with defending champion Chris Froome, last year's runner-up Romain Bardet (AG2R-La Mondiale) was in trouble again but three of his team-mates brought him back to the pack with 35km to go. 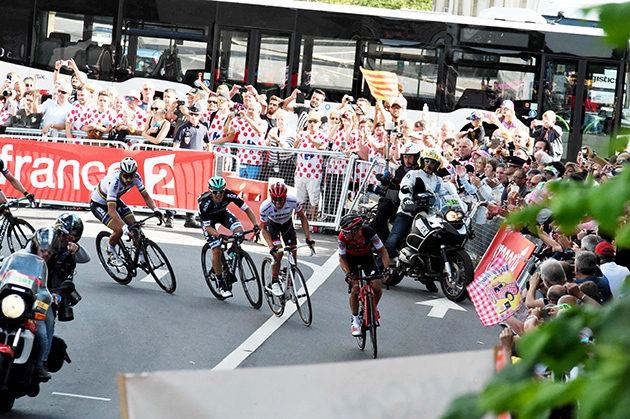 De Gendt, Calmejane, Hardy and Périchon arrived in France with an advantage of 1.25 and another 28km to cover. With just over 20km to go, Calmejane went solo despite the head wind. The Frenchman stayed away until the 10km to go mark. He was awarded the most aggressive rider price of the day. It went down to the highly expected uphill sprint finish. Hot favourite Peter Sagan (Bora-Hansgrohe) unclipped his pedal as he launched his sprint from far out but he had enough time to make it up. Michael Matthews (Sunweb) tried to pass him at the very end but lost by a wheel while Dan Martin (Quick-Step), another explosive uphill sprinter, had to be content with third place. Geraint Thomas (Sky) made the top 10 and retained the yellow jersey while Pierre Latour (AG2R-La Mondiale) became the best young rider. 11 QUINTANA NAIRO MOVISTAR s.t. 12 BARDET ROMAIN AG2R LA MONDIALE s.t. 13 WELLENS TIM LOTTO SOUDAL s.t. 14 PORTE RICHIE BMC s.t. 15 BENOOT TIESJ LOTTO SOUDAL s.t. 16 MARTIN GUILLAUME WANTY-GROUPE GOBERT s.t. 17 ARU FABIO ASTANA s.t. 18 CONTADOR ALBERTO TREK-SEGAFREDO s.t. 19 URAN RIGOBERTO CANNONDALE-DRAPAC s.t. 20 CHAVES JOHAN ESTEBAN ORICA-SCOTT s.t. 22 GILBERT PHILIPPE QUICK-STEP FLOORS s.t. 23 BETANCUR CARLOS ALBERTO MOVISTAR s.t. 24 MEINTJES LOUIS UAE TEAM EMIRATES s.t. 25 KREUZIGER ROMAN ORICA-SCOTT s.t. 26 LANDA MIKEL SKY s.t. 29 ULISSI DIEGO UAE TEAM EMIRATES s.t. 32 HERRADA JESÚS MOVISTAR s.t. 33 LUTSENKO ALEXEY ASTANA s.t. 35 HENAO SERGIO LUIS SKY s.t. 36 PAUWELS SERGE DIMENSION DATA s.t. 37 FRANK MATHIAS AG2R LA MONDIALE s.t. 38 MOLARD RUDY FDJ s.t. 40 BARGUIL WARREN TEAM SUNWEB s.t. 42 KWIATKOWSKI MICHAL SKY s.t. 44 BENNETT GEORGE LOTTO NL-JUMBO s.t. 46 GESCHKE SIMON TEAM SUNWEB s.t. 47 ARNDT NIKIAS TEAM SUNWEB s.t. 50 BOUET MAXIME FORTUNEO-OSCARO s.t. 52 STYBAR ZDENEK SKY s.t. 53 JANSE VAN RENSBURG REINARDT DIMENSION DATA s.t. 54 MACHADO TIAGO KATUSHA-ALPECIN s.t. 55 IMPEY DARYL ORICA-SCOTT s.t. 56 NAVARRO DANIEL COFIDIS s.t. 58 DEGAND THOMAS WANTY-GROUPE GOBERT s.t. 59 NIEVE MIKEL SKY s.t. 60 TULIK ANGÉLO DIRECT ENERGIE s.t. 64 VANSPEYBROUCK PIETER WANTY-GROUPE GOBERT s.t. 66 EDET NICOLAS COFIDIS s.t. 67 SIMON JULIEN COFIDIS s.t. 68 CARUSO DAMIANO BMC s.t. 69 PANTANO JARLINSON TREK-SEGAFREDO s.t. 70 SEPULVEDA EDUARDO FORTUNEO-OSCARO s.t. 71 VALGREN ANDERSEN MICHAEL ASTANA s.t. 74 KIRYIENKA VASILI SKY s.t. 75 MC CARTHY JAY BORA-HANSGROHE s.t. 76 NAESEN OLIVER AG2R LA MONDIALE s.t. 77 MORI MANUELE UAE TEAM EMIRATES s.t. 79 MARTENS PAUL LOTTO NL-JUMBO s.t. 80 ARASHIRO YUKIYA BAHRAIN-MERIDA s.t. 81 MARCATO MARCO UAE TEAM EMIRATES s.t. 84 ZABEL RICK KATUSHA-ALPECIN s.t. 85 MINNAARD MARCO WANTY-GROUPE GOBERT s.t. 86 BRAJKOVIC JANEZ BAHRAIN-MERIDA s.t. 87 CINK ONDREJ BAHRAIN-MERIDA s.t. 88 ZUBELDIA HAIMAR TREK-SEGAFREDO s.t. 89 POLJANSKI PAWEL BORA-HANSGROHE s.t. 90 ROGLIC PRIMOZ LOTTO NL-JUMBO s.t. 91 PETIT ADRIEN DIRECT ENERGIE s.t. 92 GRIVKO ANDRIY ASTANA s.t. 94 KEUKELEIRE JENS ORICA-SCOTT s.t. 96 LAMMERTINK MAURITS KATUSHA-ALPECIN s.t. 97 BAK LARS YTTING LOTTO SOUDAL s.t. 98 HOWSON DAMIEN ORICA-SCOTT s.t. 99 GAUTIER CYRIL AG2R LA MONDIALE s.t. 100 VACHON FLORIAN FORTUNEO-OSCARO s.t. 101 VAN EMDEN JOS LOTTO NL-JUMBO s.t. 104 VAN KEIRSBULCK GUILLAUME WANTY-GROUPE GOBERT s.t. 105 ROELANDTS JURGEN LOTTO SOUDAL s.t. 106 PASQUALON ANDREA WANTY-GROUPE GOBERT s.t. 107 DE KORT KOEN TREK-SEGAFREDO s.t. 108 HARDY ROMAIN FORTUNEO-OSCARO s.t. 109 GRMAY TSGABU GEBREMARYAM BAHRAIN-MERIDA s.t. 110 VICHOT ARTHUR FDJ s.t. 111 TEUNISSEN MIKE TEAM SUNWEB s.t. 113 TRENTIN MATTEO QUICK-STEP FLOORS s.t. 116 BENNATI DANIELE MOVISTAR s.t. 117 CASTROVIEJO JONATHAN MOVISTAR s.t. 118 KONOVALOVAS IGNATAS FDJ s.t. 119 ERVITI IMANOL MOVISTAR s.t. 120 AMADOR ANDREY MOVISTAR s.t. 121 DURASEK KRISTIJAN UAE TEAM EMIRATES s.t. 122 EISEL BERNHARD DIMENSION DATA s.t. 123 GREIPEL ANDRÉ LOTTO SOUDAL s.t. 125 PERICHON PIERRE-LUC FORTUNEO-OSCARO s.t. 126 MC LAY DANIEL FORTUNEO-OSCARO s.t. 127 ROOSEN TIMO LOTTO NL-JUMBO s.t. 128 KITTEL MARCEL QUICK-STEP FLOORS s.t. 129 SINKELDAM RAMON TEAM SUNWEB s.t. 130 MARTIN TONY KATUSHA-ALPECIN s.t. 132 QUEMENEUR PERRIG DIRECT ENERGIE s.t. 133 GENE YOHANN DIRECT ENERGIE s.t. 134 VOECKLER THOMAS DIRECT ENERGIE s.t. 135 CURVERS ROY TEAM SUNWEB s.t. 136 BODNAR MACIEJ BORA-HANSGROHE s.t. 137 TEN DAM LAURENS TEAM SUNWEB s.t. 138 CATALDO DARIO ASTANA s.t. 139 OFFREDO YOANN WANTY-GROUPE GOBERT s.t. 141 BOUHANNI NACER COFIDIS s.t. 142 CLAEYS DIMITRI COFIDIS s.t. 144 SCHÄR MICHAEL BMC s.t. 145 ATAPUMA JOHN DARWIN UAE TEAM EMIRATES s.t. 146 ZEITS ANDREY ASTANA s.t. 147 SENECHAL FLORIAN COFIDIS s.t. 150 PINOT THIBAUT FDJ s.t. 151 GROENEWEGEN DYLAN LOTTO NL-JUMBO s.t. 154 GESINK ROBERT LOTTO NL-JUMBO s.t. 155 BONO MATTEO UAE TEAM EMIRATES s.t. 156 SIEBERG MARCEL LOTTO SOUDAL s.t. 160 WAGNER ROBERT LOTTO NL-JUMBO s.t. 161 VENTER JACOBUS DIMENSION DATA s.t. 162 HOLLENSTEIN RETO KATUSHA-ALPECIN s.t. 165 LAPORTE CHRISTOPHE COFIDIS s.t. 167 CUMMINGS STEPHEN DIMENSION DATA s.t. 168 PHINNEY TAYLOR CANNONDALE-DRAPAC s.t. 169 ROLLAND PIERRE CANNONDALE-DRAPAC s.t. 171 CAVENDISH MARK DIMENSION DATA s.t. 174 GALLOPIN TONY LOTTO SOUDAL s.t. 175 DOMONT AXEL AG2R LA MONDIALE s.t. 178 GUARNIERI JACOPO FDJ s.t. 182 DE GENDT THOMAS LOTTO SOUDAL s.t. 185 BOZIC BORUT BAHRAIN-MERIDA s.t. 187 HANSEN ADAM LOTTO SOUDAL s.t. 189 BROWN NATHAN CANNONDALE-DRAPAC s.t. 190 BACKAERT FREDERIK WANTY-GROUPE GOBERT s.t. 192 SAGAN JURAJ BORA-HANSGROHE s.t. 193 SELIG RÜDIGER BORA-HANSGROHE s.t. 194 VERMOTE JULIEN QUICK-STEP FLOORS s.t. 16 ULISSI DIEGO UAE TEAM EMIRATES s.t. 17 DEMARE ARNAUD FDJ s.t. 76 TEUNISSEN MIKE TEAM SUNWEB s.t. 79 SIMON JULIEN COFIDIS s.t. 89 KEUKELEIRE JENS ORICA-SCOTT s.t. 97 GASTAUER BEN AG2R LA MONDIALE s.t. 101 CASTROVIEJO JONATHAN MOVISTAR s.t. 109 MINNAARD MARCO WANTY-GROUPE GOBERT s.t. 111 PETIT ADRIEN DIRECT ENERGIE s.t. 116 GREIPEL ANDRÉ LOTTO SOUDAL s.t. 118 CATALDO DARIO ASTANA s.t. 144 DURASEK KRISTIJAN UAE TEAM EMIRATES s.t. 151 ROLLAND PIERRE CANNONDALE-DRAPAC s.t. 152 BURGHARDT MARCUS BORA-HANSGROHE s.t. Points leader Marcel Kittel heads to the start. Looking at the riders' faces, this final ascent to the finish must be pretty tough. The big boys hit the final climb. Peter Sagan is well-positioned. That second rider should be Alberto Contador. 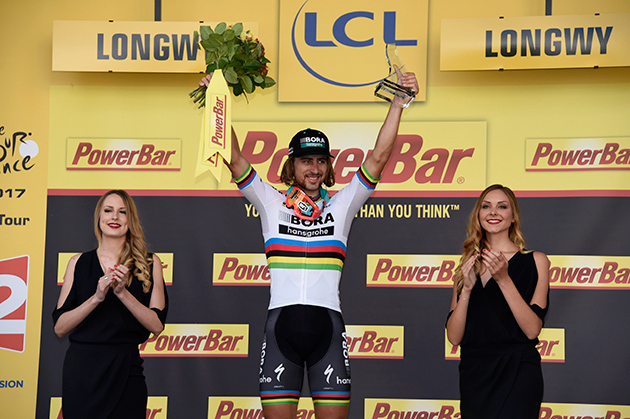 And Peter Sagan get his eighth Tour win. Nathan Brown is the new King of the Mountains. Geraint Thomas retains his overall lead. 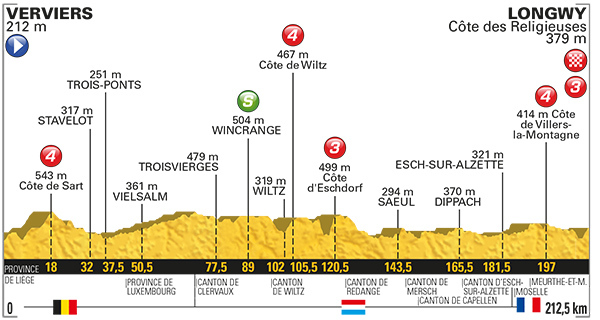 Starting from Philippe Gilbert's native town of Verviers, stage 3 is much hillier than stage 2. A visit will be paid to the car racing circuit of Spa-Francorchamps after 20km of racing through the Ardennes on the roads of Liège-Bastogne-Liège, the oldest of the big classics. 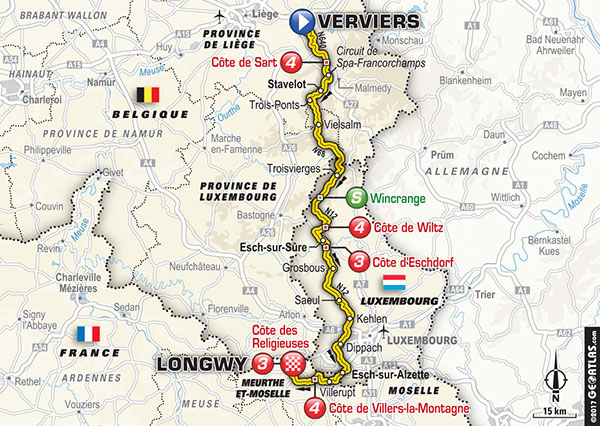 130 kilometres of the course are in Luxemburg, the country of the recently retired Schleck brothers. One Luxemburger, Ben Gastauer of AG2R-La Mondiale, is part of the 195-rider strong peloton. Everyone else who is not familiar with this small country will realize it's not a flattish one. Stage 3 is long too: 212.5km. It might be a hard day for some riders. It's a land of opportunities as well. 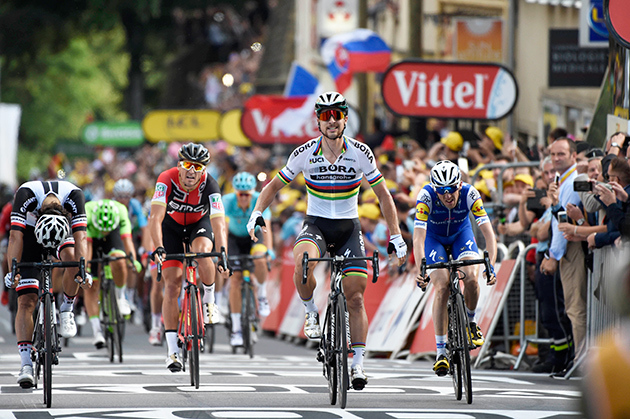 The finish on French soil in Longwy atop the 1.6km long climb of the Religieuses surely pleases Peter Sagan as much as the hill to La Glacerie in Cherbourg-en-Cotentin at the end of stage 2 last year. The finish suits Gilbert too, and many others who would be well inspired to make the race hard earlier on.